The emerging hard seltzer segment wins appeal with health- and fitness-minded consumers. The hard seltzer segment, including SpikedSeltzer (pictured), which is owned by Anheuser-Busch InBev, has surged in popularity in recent years. Last year was indeed a boom year for the RTD hard seltzer segment. Nick Shields, co-founder of the SpikedSeltzer brand, now owned by Anheuser-Busch InBev (A-B InBev), says the segment is now a $500 million category, and projections suggest it will double in 2018. Some 15 brands are now competing in the category. Shields and others point to the growth non-alcoholic seltzers and sparkling waters are enjoying and believe the same will be true of spiked options. “People are getting into all things sparkly,” says Christian McMahon, president of Wachusett Brewing, which markets Nauti hard seltzer. Moreover, with continued consumer interest in leading healthier and fitter lifestyles, alcoholic seltzers—with little sugar or carbohydrates, and generally lower in calories and alcohol than other RTDs—are poised to capitalize. O’Neill and McMahon both note that consumers often opt for variety packs of the seltzers as they may be trying the products for the first time and prefer to sample a range of flavors. As with other beverage categories, the rosé craze is now making its mark on hard seltzers, with brands like Nauti and Diageo’s Smirnoff Spiked debuting rosé-inspired expressions. At retail locations such as Ohio-based Buehler's Fresh Food (cooler pictured), many spiked seltzer brands can be found in multi-flavored 12- or 15-count variety packs. Sales of leading hard seltzers surged at double- and triple-digit rates last year, albeit on small bases. According to Impact Databank, Truly’s volume more than doubled to 2.1 million 2.25-gallon cases, from 915,000 cases in the year prior. The Boston Beer product is available in eight flavors, including the new Wild Berry. “We’re focusing on associations with active lifestyle events,” O’Neill says of the brand’s marketing plan. Truly is also sponsoring the Association of Volleyball Professionals (AVP) beach volleyball tour this year. Mike’s Hard Beverage Co.’s White Claw hard seltzer, meanwhile, surged fivefold last year, with volume reaching 1.7 million cases, up from just 300,000 cases in 2016, according to Impact Databank. 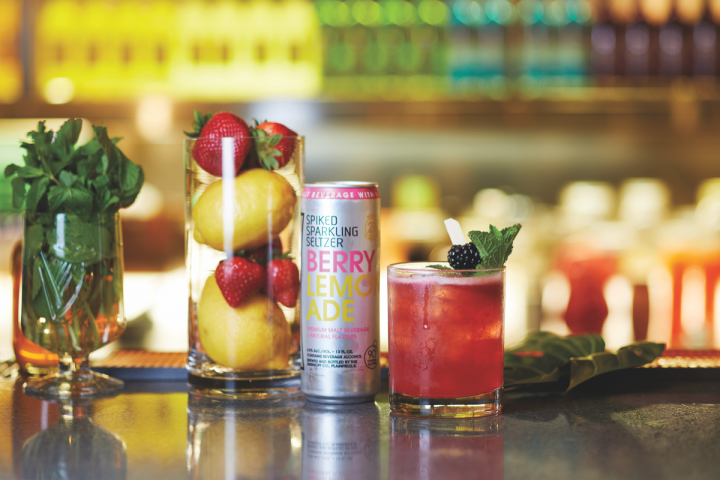 Hard seltzers are capitalizing on the same flavors as other beverage categories, pushing fruit-based offerings (Diageo's SmirnoffSpiked Berry Lemonade pictured) for the summer. 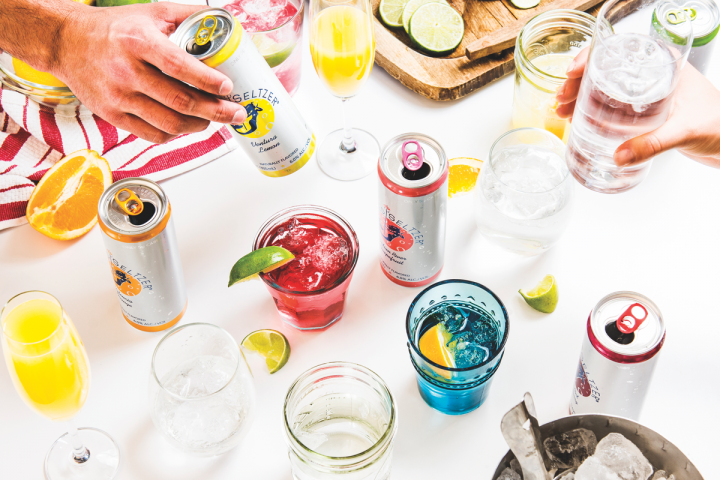 According to Shields, sales of SpikedSeltzer nearly quadrupled last year, following A-B InBev’s 2016 acquisition and subsequent national rollout of the brand. SpikedSeltzer was first introduced regionally in the east five years ago, and is considered one of the category’s pioneers. Today, the brand is available in 6-packs of six different flavors, as well as 12- and 24-count variety packs. Shields says that more flavors will be unveiled next year. In the spring, A-B InBev launched national advertising for SpikedSeltzer under the “Follow Your Siren” tag line, with support including television and out-of-home ads. A-B InBev rival MillerCoors is also stepping up support of its entry, Henry’s Hard sparkling water. Launched last year in bottles, the brand has been reformulated and repackaged into 12-ounce cans this year. Henry’s Hard sparkling water is available nationally in lemon-lime and passion fruit flavors in 6-packs, and in a new 12-count variety pack with a third, variety pack-exclusive flavor, strawberry kiwi. The brand is supported with national TV ads accompanied by the tagline “Good. Light. Fun.” According to associate brand manager Katie Feldman, additional support includes out-of-home ads, digital and social media, and sampling events at regional and national chains, including Publix, Target, Kroger, and Jewel. “We’re in discussions with many other retailers to bring Henry’s Hard sparkling to more shoppers,” Feldman says. Regionally distributed hard seltzers include the Nauti and Press brands. First launched two years ago, Nauti is marketed primarily in New England and the mid-Atlantic. It’s available in six flavors and is packaged in 6-packs and 15-count variety packs. “Sampling is key,” McMahon says. Support for the brand also includes tastings in-store and at area festivals. Press, meanwhile, is marketed by Milwaukee-based XYZ Beverage Co., and is currently sold in 30 states. The product is available in four flavors—with more to come in the fall, according to founder and CEO Amy Walberg—in 4-packs of 12-ounce cans, along with an 8-count variety pack. 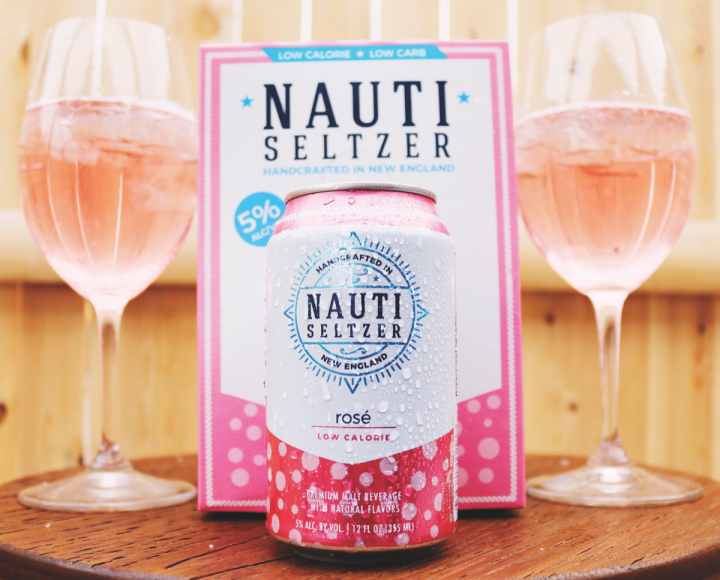 Support for Press includes sampling and p-o-s.
Like fruit-based seltzers, rosé variants (Wachusett Brewing's Nauti seltzer) are also popular during the summer, which is the segment's prime season. By all accounts, the hard seltzer consumer is focused on health and wellness. “Health-conscious drinkers seek balance in their lives,” says Boston Beer’s O’Neill. “They care about their health and wellness routine, but are also looking for options that fit into their social lifestyle.” Walberg and Kiisk cite women as the more prevalent consumer of spiked seltzers, and Shields and O’Neill say the drinks appeal to consumers of non-alcoholic seltzers. Most hard seltzer marketers agree that consumers of the products are typically wine and spirits drinkers. “SpikedSeltzer is popular with white wine, rosé, and clear-spirits drinkers,” says Shields. That’s an ideal consumer for Ohio-based Buehler’s Fresh Foods, according to beer, wine, and liquor director Ron James. “Hard seltzers appeal to consumers who are looking for lower-calorie products,” he says. 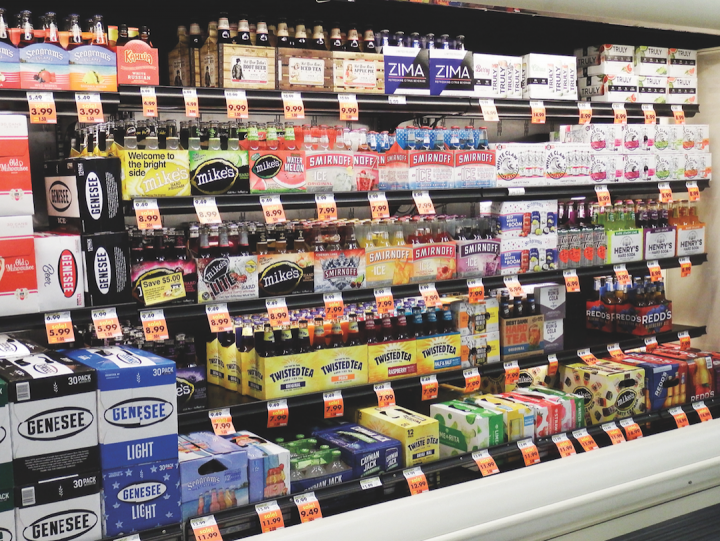 “They tend to be more popular with women than men, so as a grocery store, it’s a good segment for us.” The 13-store chain offers four different seltzers, generally priced at $8 a 6-pack and $15 a 12-pack, with Truly and White Claw ranking as the top sellers. To merchandise, Buehler’s is featuring floor programs throughout the summer. 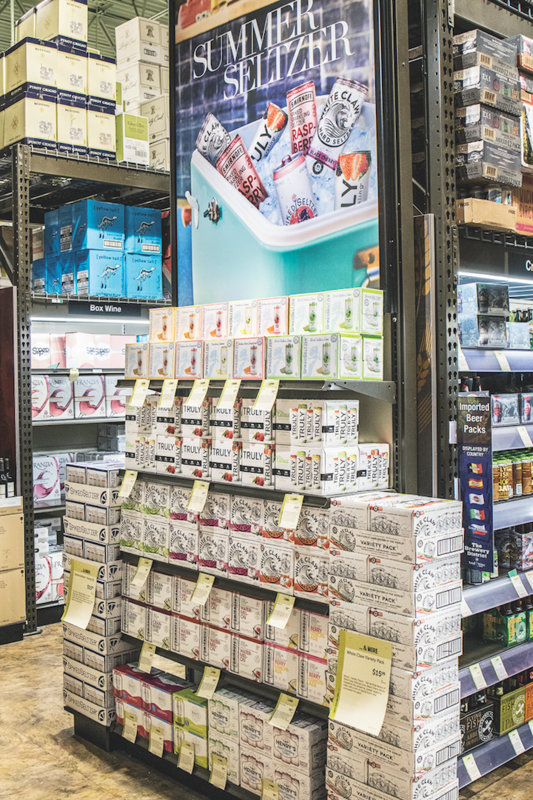 Cans are the preferred container for hard seltzers, as they are lighter and more portable than bottles, enabling consumers to enjoy them in varying locations (Total Wine & More hard seltzer display pictured). Mixology and on-premise usage also present opportunities for the burgeoning segment. “I recently saw a customer purchase Truly Pomegranate, a bottle of vodka, and fruit—consumers are building cocktails around hard seltzers,” says Cook. A-B InBev promotes the usage of SpikedSeltzer as a cocktail mixer, and according to Shields, the company has partnered with Wölffer Estate winery on Long Island to create drinks with its Pink gin. “Expect more brand partnerships in the coming year,” Shields adds. While hard seltzers have little presence in on-premise accounts to date, marketers aren’t ruling out the channel. Feldman says the company is investigating test markets for an on-premise sampling program for Henry’s Hard sparkling water.